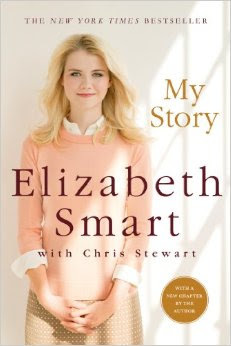 ' Book Review: My Story - Elizabeth Smart - Sisters, What! I don't think I've written a review on here in a long time, but I also haven't read a book that impacted me so much in a long time. Elizabeth was a fourteen-year-old girl who was kidnapped from her home by a religious fanatic in June 2002. Him and his wife kidnapped her all in the name of God. She was abused, rapped, and threatened on a daily basis. This book is her story. What she went through and how she overcame her trial. I for one can't even put in words how touched I was/am by her faith at such a young age. I'm pretty sure at her age I would've given up. I would have been angry and depressed. Despite what she went through she came out on top and is not an advocate for child abduction and a light to many. She was rapped daily, was forced to drink large amounts of alcohol, and sometimes even drugs, and told if she ever tried to run or defy them her family would be killed. She speaks of how her faith and her grandfather helped her get through this horrible trial, a trial no child should have to endure. She ends the book by talking about how gratitude has helped her stay happy. As a huge advocate for gratitude this touched me. Something as simple as being grateful has helped her put nine absolutely terrible months behind her and live a full happy life. I highly recommend this book to anyone. No matter what faith, or beliefs you have, you'll be touched by this young girls experience and how she has handled it all. "Life is a journey for us all. We all face trials. We all have ups and downs. All of us are human. But we are also the masters of our fate. We are the ones who decide how we are going to react to life.